Our wine guide was created as a resource to help you enjoy wine. While all wine guides are slightly subjective, we have attempted to create a wine guide that covers the basics of wine pairing. Our food and wine pairing guide is designed to help you easily pair a wine with your favorite dish. So, whether you are grilling steak, seafood or any other food or if you are preparing for a party, our wine guide will help you to quickly pair a wine with your food choice. Pairing wine with seafood can be a little more of a challenge due to the complexity and variety of different seafood available. 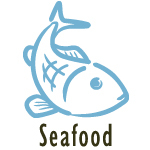 The term “Seafood” encompasses saltwater and freshwater varieties of fish and shellfish which range in texture, taste and preparation. To make your life easier, we have broken it down. Getting ready to grill a juicy steak? 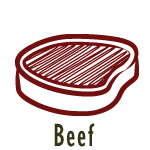 Beef is a wonderful food to pair with wine, and one of our favorite foods for the summer. We have a few favorite varieties of ours that we would like to share with you to make your next outdoor grilling party a success. Pinot Noir (red), Merlot (red), Cabernet (red), Zinfandel (red). There are hundreds of ways to prepare a dish with poultry; from grilled, fried, baked or BBQ, the possibilities for pairing are endless. 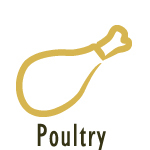 For now our guide will stick to the basics and not get too involved, later we will produce an advanced guide to help you with the nuances of poultry. Beaujolais (red), Chenin Blanc (white), Gewurztraminer (white), Riesling (white), Sauvignon Blanc (white), Chardonnay (white), Extra Dry (Sparkling Wine), Brut (Sparkling Wine), Blanc de Blanc (Sparkling Wine), Blanc de Noir (Sparkling Wine). Like wine with your ribs or pork? Pork comes in a wide variety of cuts and offers the chef dozens of ways to prepare. 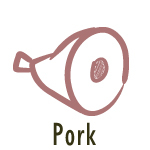 Pork is perfect for rubbed seasonings, marinades and glazes and can be baked, grilled or cured and smoked. So, weather you like Chops, boneless, whole ham, glazed, boiled or baked or ribs, We Speak Wine has a perfect wine for you. Beaujolais (red), Pinot Noir (red), Gewurztraminer (white), Riesling (white). Wine and pasta, a great combination? Pastas are served alone but are often accompanied with meats including chicken, seafood or beef (nothing like spaghetti and meatballs). 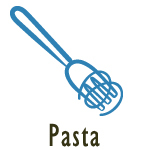 Pastas may be served with red sauces, or white cream sauces. Finding the right wine to go along with your favorite pasta dish or newly discovered recipe can be a challenge for anyone. We put together a list of some of our favorite wine types that pair well with pasta. White Sauce: Pair with Sauvignon Blanc, Seafood dishes go well with Pinot Grigio or Viognier Red Sauce: Pair with a Chianti or Zinfandel (or your favorite red wine). 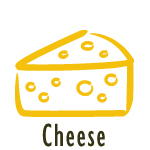 Cheeses are as complex as any other food type, they come in a variety of textures, smells and flavors. Typically white wines have been paired with soft cheeses and hard with reds, but there are no borders or cheese police that will rain down on your next wine tasting, so break out a wheel and drink some wine. Beaujolais (red), Pinot Noir (red), Merlot (red), Cabernet (red), Zinfandel (red), Port (red), Chenin Blanc (white), Gewurztraminer (white), Riesling (white), Sauvignon Blanc (white), Chardonnay (white), Extra Dry (Sparkling Wine), Brut (Sparkling Wine), Blanc de Blanc (Sparkling Wine), Blanc de Noir (Sparkling Wine).